PLAN in advance your evacuation and safety measures. When you first see lightning or hear thunder, activate your emergency plan. Now is the time to go to a building or a vehicle. Lightning often precedes rain, so don’t wait for the rain to begin before suspending activities. IF INDOORS… Avoid water. Stay away from doors and windows. Do not use the telephone. Take off head sets. Turn off, unplug, and stay away from appliances, computers, power tools, & TV sets. Lightning may strike exterior electric and phone lines, inducing shocks to inside equipment. INJURED PERSONS do not carry an electrical charge and can be handled safely. 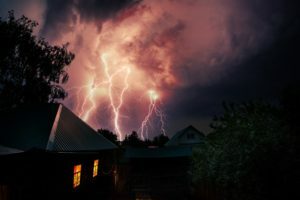 Apply First Aid procedures to a lightning victim if you are qualified to do so. Call 911 or send for help immediately. KNOW YOUR EMERGENCY TELEPHONE NUMBERS.